No, I’m not losing my mind. Regular visitors to the site will know that I slam arborvitaes on occasion, particularly the overused “Techny,” a great, gangly tree-shrub that seems magically to appear growing just off the front-right corner of half the houses between here and Hudson. This is a fairly new variety, I don’t remember, became available six years ago maybe, and it’s about the narrowest upright evergreen you can grow in the north. It’s this beautiful, rich, vertical slash that works well with lower, rounded or mounding shrubs or evergreens. It also looks great in formal gardens and landscapes, and makes a nice tight hedge. ‘Spire’ matures slowly to six feet tall but only then will it approach two feet wide. It’s just a cool little rocket that requires little to no shearing to retain its slender shape. The solid green foliage grows toward the sky, so you don’t get the kind of messy, flayed-out foliage look of the broader arbs. ‘Spire’ grows well in slightly acidic to neutral soil, and like most arbs appreciates a good, deep watering every four to five days the first two months after planting, weekly after that the first full season, every two weeks after it’s established. That’s how I water them, anyway, and they flourish. Flourish in FULL SUN, that is. This is an arb that prefers a minimum of six hours direct sunlight; more is better. Here’s a new variety (Note: same genus, same species, different variety) that became available two years ago. 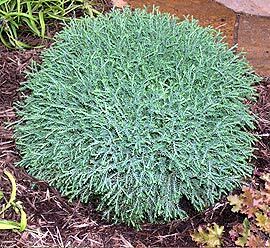 Also slow growing, Mr. B features very dense, sage-green foliage that is remarkably fine, resembling a fine-textured juniper or a chamaecyparis. It tolerates a wide range of soil types and pH range, but does like good drainage. Mature height and width is three feet by three feet, and if you want to shear it once a year you can keep it perfectly rounded, if that’s your thing, or leave it alone and let it acquire a slightly erratic, mounding shape. Assuming you mulch with shredded hardwood, you don’t need to water as frequently as ‘Spire.’ Water moderately once a week the first two months after planting, every ten days to two weeks after that, and they will do very well. Oh, and while the plant is fine in full sun, it will flourish in part shade, morning sun/afternoon shade, or vice-versa.